If you haven’t read part 1 or 2 yet, you can find them here and here. When shooting wraps on an episode, the toughest part of the work is just beginning. Each episode of ARRESTED DEVELOPMENT seems to require about twenty hours of intense editing work from Mitch and he often wants me to be a part of it. Why? Because I was there for the shooting, so I know all the footage and I also know where the good takes are. It’s dazzling. And I discover how much each episode is actually rewritten in the editing room and how truly handcrafted these things are. Eventually, a list of pick-up shots and little rewrites is generated and, while we’re shooting next week’s episode, we’ll find time to reshoot (or newly shoot) some things for the episode that’s currently being edited. I begin to wonder how there are enough hours in the day to accomplish everything that needs to be done. The writing of next week’s show is happening at the same time that we’re shooting this week’s show and editing last week’s show and mixing the sound on the previous week’s show. That’s the way it always is in TV except the time investment on ARRESTED seems triple that of every other show — and it all rests on Mitch’s shoulders. He’s exhausted. We’re exhausted. People hardly ever see their families or the sun. Everyone gets sick. Colds and flus make their way through the set and the writer’s room with a special vengeance. And somehow… somehow it all gets done, although in retrospect it’s hard to remember exactly how. It all has a dreamlike quality. Even though, occasionally, we make minor changes, the scripts on ARRESTED DEVELOPMENT are always shot as written. The structure of the episodes is so complicated that there’s very little room for ad-libbing, although sometimes we’ll try stuff if we get a solid take of the scripted material first. David Cross, in particular, loves to do this and he’s hilarious. I come to be astonished by the effortlessness of Michael Cera’s performance as George Michael. He’s a kid — nineteen years old — and I’ve never seen an actor so incapable of delivering a false beat. No matter what the line is, he does it perfectly, take after take, day after day, always finding an interesting and honest interpretation. It’s amazing in someone so young — or in anyone, really. I’m not surprised, a couple years later, to see him become a big movie star. During season 4, he joins the writing staff and we discover he’s just as good a writer as he is an actor. Paul Feig is one of the directors (a terrific one at that — he recently directed BRIDESMAIDS and THE HEAT) and he always wears a jacket and tie. Always. We’re on location, sitting in a covered camera car shooting footage of the “cabin car” and sweat is pouring off Paul. I say “Paul, why don’t you at least take off the jacket and tie?” He tells me he never takes it off. And he doesn’t. Ever. Jason Bateman is very analytical and thinks like a director. Dry and always hilarious, he’s game for anything. We cast his sister, Justine Bateman, as a woman that he has an odd sexual attraction to. He’s on board for something potentially so creepy and so is she. Anything for a laugh. He and the rest of the cast remind me of Damon Wayans in that way. Comedy is not for the weak. We’re literally killing ourselves to make this show but, in spite of all the Emmys and accolades, the ratings aren’t there. The show gets cancelled. It’s a shock but, frankly, everyone needs the rest. It’s not until much later that we all realize how special the experience was. 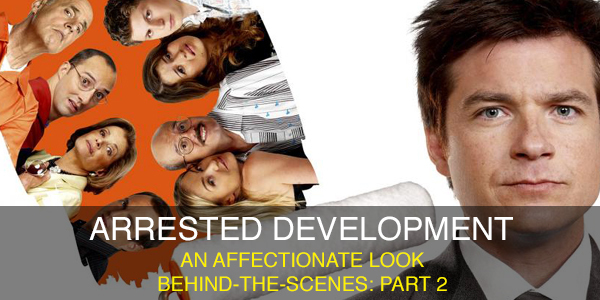 Whenever people ask me about shows I’ve worked on, ARRESTED DEVELOPMENT is usually the one they’re most interested in. Hope you enjoyed this look at the making of ARRESTED DEVELOPMENT season 3. Behind-the-scenes of season 4 to come somewhere down the road, along with the inside scoop on many other TV shows and movies, including MAJOR PAYNE and MY WIFE AND KIDS. Check back!